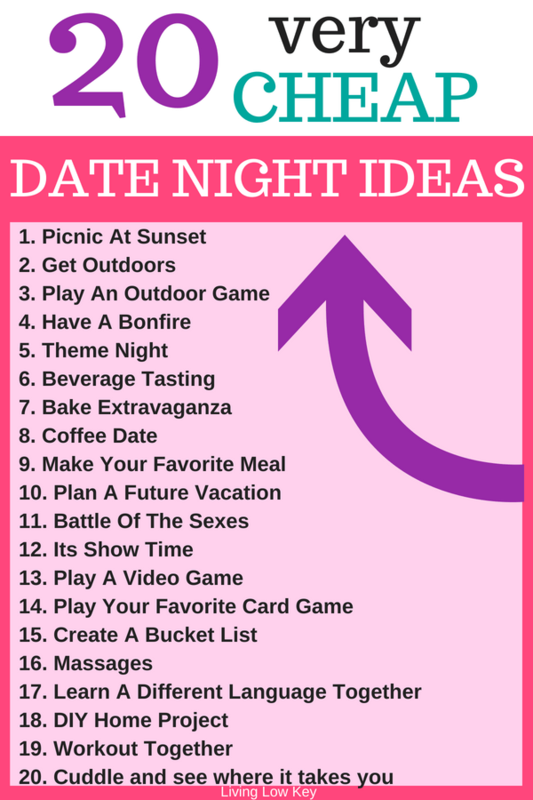 Date night ideas you’ll love! 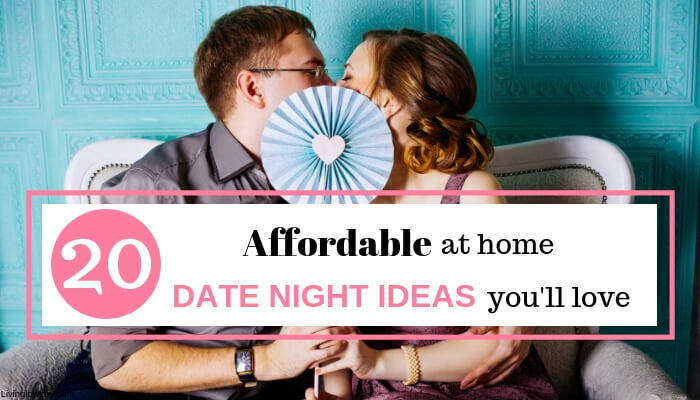 My favorite romantic at home date night ideas are always the ones that save us money! Don’t get me wrong I love getting out of the house, but being able to have my cake and eat it too all from the comfort of my home is an amazing thing! You’re going to love these easy ways date night in ideas! My husband and I use to do regular date nights, on a weekly basis… And then we had 2 kids. Having kids is hard, date nights are few and far between. When you do get out you’ll most likely spend half of your time talking about your kids and the other half of your time wondering what they are up to. I can’t be the only one who does this, or am I? On top of that, babysitters charge A LOT these days. Like a lot a lot!! My husband and I are really picky about who watches our kids but we also know its important to take time for ourselves together. Remember, date night doesn’t have to cost a lot of money to be meaningful and fun! Start Saving More Money and Paying Off Debt Today!! You did it!! You'll receive an email from us shortly with the first bit of information you'll need. Make sure you check your spam or promotional boxes if you don't see it in your inbox. If that's where we ended up, make sure you add us to your known contacts so you don't miss anything! We're really excited for you to take these next steps towards financial freedom!! Who lets their kids stay up late on the weekends? I don’t… Okay so maybe every once in a while I do. Our kids are still young though, the oldest is only 4 so if we aren’t having our family “movie night” they are in bed on time. Once the kids are in bed let the fun begin!! Make sure your significant other is on board for date night. Is your significant other going to be home that night? Does he or she have other plans? Make sure you’re both on board. More than likely you will be. Honestly, if date night sneaks up on us and we don’t have a plan we will more than likely spend our night working or twiddling our thumbs on the couch. Have a plan and make it exciting! If you don’t, your spectacular “date night in” will be a bust. My husband and I take turns doing date night. This makes it exciting because we have no idea what the other one has planned! We try and do this twice a month. So, for all of you who can’t manage to fit in date nights, believe me, we know its hard. You only have to plan something for you and your partner once a month. Just once!! Your partner will take care of the other date night. I promise you this will be something new and exciting that will add to your relationship! You can have a picnic just about anywhere, but in the summer our favorite place is the back deck. So hold off on dinner that night. Feed your kids and put them to bed. Then plan your own little special dinner that doesn’t involve mac and cheese and hotdogs. Relax and enjoy the sunset together sipping on your favorite beverage. How often do you get outdoors and hang out? I bet it isn’t often enough. Get outside and just hang out. Shovel the snow, do yard work, throw a ball around, you name it and just do it! Who doesn’t love yard games? This is one of my favorite parts of summer. Before last summer, we didn’t have a yard, so we definitely take advantage of yard games now. So grab a drink and head outside. The sun sets late in the summer for a reason, go enjoy! Yardzee– You’ll love this game! I highly recommend Yardzee, it’s even more fun if you are having a group date night at your house. Ladder Golf – We’ve had this game forever and it never gets old. Or maybe that’s because I win every time! Lawn Bowling – The name speaks for itself! Time to spruce up on your bowling skills. My husband always beats me with this one. Pull out those marshmallows and make yourself a little fire in the backyard. Sipping on your favorite beverage watch the sunset together. Then run for the hills when the mosquitos come a bitting. Seriously though!! If you live in Minnesota you know what I’m talking about! Pick a theme for the night! Then plan dinner, dessert and a movie around that theme. This takes a little planning but its fun! This has always been my favorite date night idea. That’s why it’s on of the first on the list! Are you lovers of alcohol, kombucha, or any other beverage? We love trying out new craft beers or different types of wine. So every once in a while we will do a beer tasting. We love Total Wine they have a great selection of beer. If you have one close by go check them out. You can buy beer buy the bottle, so we usually just fill up a 6 pack and call it good. If any baking is being done once the kids are in bed it usually involves some type of delicious dessert! We are sugar junkies. We try and stick to desserts that don’t require too many odd ingredients. We’re cheap, we know! If you are looking for the best desserts out there, we find ours on Pinterest! Seriously, what can’t you find on there? And don’t forget to follow us while you’re at it. Date nights don’t always have to take place at night! Some of our best conversations happen over coffee after breakfast. We send the kids to the living room to play and enjoy some delicious home brewed coffee. Whats your favorite meal? Or your favorite meal that you both enjoy? We are pizza fanatics! My husband makes the best chicken alfredo pizza. If you haven’t tried it you must! Let me know if you want the recipe. Who doesn’t love a nice family vacation? Or maybe you are looking forward to a kid-free vacation? Whatever it may be, having something to look forward to like a nice trip is motivating! So plan out your next vacation, you’ll be glad you did. Have you ever played Battle Of The Sexes? If not you’ll get a kick out of this board game! Men vs. Women!! You’ll have yourselves laughing at each other all night long! The more you drink the better it gets! Remember date nights don’t have to end once you have kids! 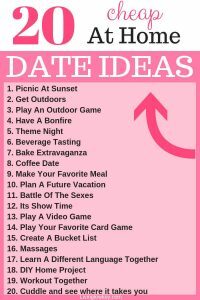 It’s important to make time for each other so start taking your stay at home date nights ideas to the next level. There are so many cheap options for watching movies and tv shows nowadays. So what better way to spend a night than cuddled up on the couch together watching your favorite tv show. Our favorite way to do this is with HULU. They have all the great TV shows which air a day after they air on real-time TV. They are super affordable, we only pay $7.99 a month. You can also cancel at any time, with no contract! If you want to try it out for a month for FREE check it out here. My husband loves this! We have tons of video games from 10+ years ago some of which we used to play together. It’s fun to pull out a thing from the past that brings back memories. The older the better! Who remembers the original Donkey Kong? I haven’t always been a big “game” fan myself, however, over the years they have really grown on me. Now I look forward to our card game nights. Card games are fun and they get you communicating with your partner.. and of course they get you laughing. Who doesn’t have a bucket list?? Well, you should! A bucket list should include things you want to try, experiences you want to have or places you want to travel to in your lifetime. Your bucket list can be short-term or long-term or both! When you’re done compare with your partner. Then make a plan to knock one of those items off your list this year! How many languages do you know? More than one? You can actually make this into a really fun game that extends past date night. A few years ago we went on vacation only to realize that nobody spoke English! Oops, my bad… First out of the country experience. It was a steep learning curve in such a short period of time, but it was so fun! This has been our favorite DIY project to date! We refurbished an old oak table that we found on Craigslist and it turned out amazing!! We have done so many DIY projects around our house I couldn’t count them if I wanted to. It’s great bonding time! Are there any DIY projects you’ve been wanting to get done around the house? What skill have you been wanting to pick up but haven’t found the time? Our go place for learning new things is YouTube! You can seriously learn just about anything by watching Youtube videos. How to lay new laminate floor throughout our house. Learning how to do things together is fun! Have you ever heard those who workout together stay together? Or so I like to tell myself. Working out feels good for a reason, its good for you! And it’s a confidence builder. So start getting a workout in together. Even if it’s just ten minutes. You’ll love the changes you’ll see in yourself and the new spark you will see in your relationship. After kids, cuddling becomes a thing of the past! By the time our heads hit the pillow at night we are out in a flash. Making time to do the things you used to do before kids or before your busy career took off is important! If you loved this post make sure to SAVE IT! These are awesome! Will be trying a few! as looking after children can take over completely. Wondered at the choice of no 1? coffee dates are the best 🙂 such a nice list! Thank you!! I’m glad you liked the list! I’m glad you liked it! Hopefully, some of these tips will come in hand.